Many moons ago there was an amazing game that kept me coming back to my Amiga 1200, that game was K240. Build up your asteroid, create ships, and take over other asteroids. It was brilliant, had fantastic replay value and was a game type I missed until I discovered the original Sins of a Solar Empire. At this point I should disclose that to say I’m a bit of a fan of the Sins series is a bit of an understatement. 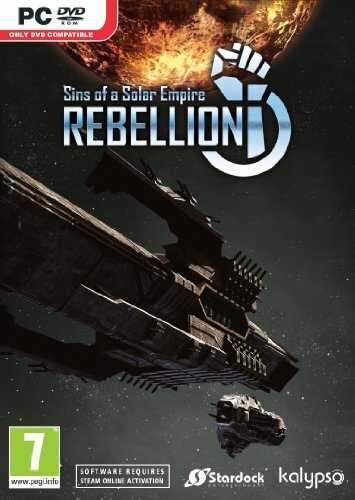 It’s really not been hard to write a Sins of the Solar Empire: Rebellion review as the series has been one I’ve returned to again and again over the years; it’s the reason I’ve upgraded my PC and put down my Xbox pad and is the reason I’ve ordered the rather pricey (due to being in the UK) special edition which has a model ship. To find out a new release was on its way filled me with joy and immediately had me pre-ordering and signing up for the beta trials. The final game has been released, downloaded and hammered on my newly built PC. Firstly, hats off to the developers for their fantastic work on making this accessible to all types of PCs. Before upgrading I was actually playing this on a 10 year old single core PC, and yes it suffered slowdowns and looked a bit rubbish but it did work and could be played. But put this on a decent modern PC and it comes into its own. The detailed graphics are fantastic, zooming up to the individual ships and then out to a view of multiple galaxies never gets old. Having the camera automatically lock onto the ship you’re taking interest in allows players to rotate and move the camera around mid battle while easily retaining focus, directing your own epic cinematic sci-fi space battle on the fly. Where Sins is concerned the word epic can be used a lot. The size of play area can be epic, the space battles are epic, and the music is epic. Such epicness might make potential gamers wary of an overly complicated control system, but actually it’s really easy to use. Keyboard map away to your heart’s content, but I’ve found the humble mouse with wheel suitable for the majority of command issuing. The interface is clean and logically laid out; you’re never more than a couple of clicks away from your desired action. Having been a long time fan I was a little disappointed that this felt more like an expensive expansion pack rather than a full blown follow up. All the features of previous expansion packs are present, but what you now have is the split in races between loyalists and rebels and their unique research trees and Titan class ships. Titan’s are well named; they truly feel huge and dwarf all previous ships and structures that felt big in previous games. A restriction of one Titan ensures the game remains well balanced and prevents a total whitewash. As powerful as they are they’re not indestructible, and the thrill of pulling your race back after receiving a huge kick in is one of this games highlights. The diplomacy options are still all present and correct. They can be easily overlooked and forgotten about, but life in Sins is much easier if you at least attempt to get on with a couple of the solar neighbours. A single player campaign is still missing, not much of a deal breaker given the replay value of games but given the brilliant introduction it might be nice in the next version if they could include a few missions that encourage players to try out different game types/play styles (so a defensive mission, offensive mission, economic mission etc). This game is truly special and will swallow huge chunks of your life. In a time where full games can often be completed in less than 24 hours it’s refreshing to find a game that could, at its most epic, last months. If you have a PC, like games that look brilliant, sound superb and offer the most replay value out of any game I’ve ever played then buy Sins of a Solar Empire: Rebellion. Buy it NOW!